I know it's not new, but the fact is that DNS tunneling just works when a lot of other egress methods fall flat on their faces. I've been playing with DNS tunneling in earnest for the past few weeks, since I don't really have much better to do. So, why does DNS tunneling work, anyway? First, let's look at the two main environments where you'd be likely to use DNS tunneling: Captive portals and enterprise web filters. 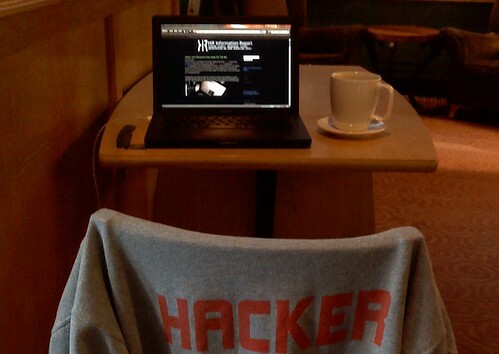 Most captive portal systems (as found in coffee shops, hotels, airports) block all IP to external hosts until you've paid, accepted the terms of service, or enter a valid code that a customer service rep gives you. They often employ a transparent http proxy to redirect you to the captive portal's main interface, via meta refresh or HTTP 3xx redirect. Most enterprise web-filters work by providing a SOCKS or HTTP proxy, and not allowing direct HTTP or HTTPS connections out from employees' workstations. If the content isn't allowed by the filter, the proxy returns an error message to the users. Some hospitals I've visited use a hybrid of these technologies: employing both transparent proxies and web filtering. Generally, captive portal operators have very little recourse aside from banning you, if you get caught tunneling. People get fired for pulling these tricks with employers. As always: use this stuff wisely. Now comes the fun part: DNS still works, more often than not, in both of these situations. To test it, try doing an nslookup on a popular domain. If it doesn't return a "private" RFC 1918 IP address (192.168.0.0/16, 172.16.0.0/12, 10.0.0.0/8), then there's a good chance DNS tunneling will work. While you can't connect via UDP to any external servers, your computer can usually make requests against an internal DNS server all day long. When you tunnel via DNS, you are using a client program that encodes data into DNS requests, all of which are designed to go to the DNS server you configured earlier in this article. 2) The tunnel program makes a DNS request for your tunnel subdomain to the private DNS server. This chart will explain it, too. The first and hardest part for any of us, is getting our "server" (at home, co-located, or what have you) set up as an authoritative name server for a subdomain. It's also necessary that DNS traffic (UDP Port 53) can get to your server. You'll have to configure that in your own firewall (at home) or check it with your provider. In my case, I'm running this in my DMZ with external-facing IP addresses and no firewall rules running on the router itself. I'm using no-ip.org for dynamic DNS to my home environment. To add a subdomain name server, first you have to buy a domain and have primary nameservers. 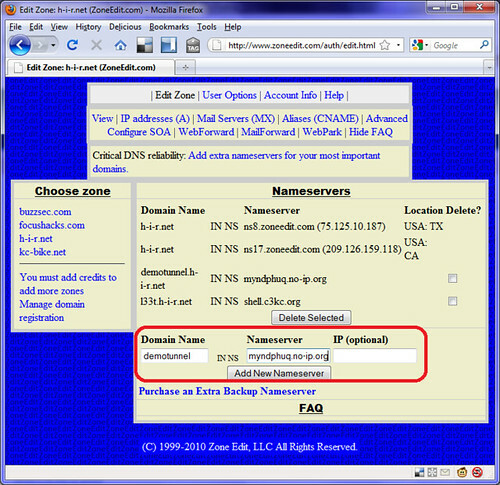 Most registrars allow you to fiddle with your DNS. 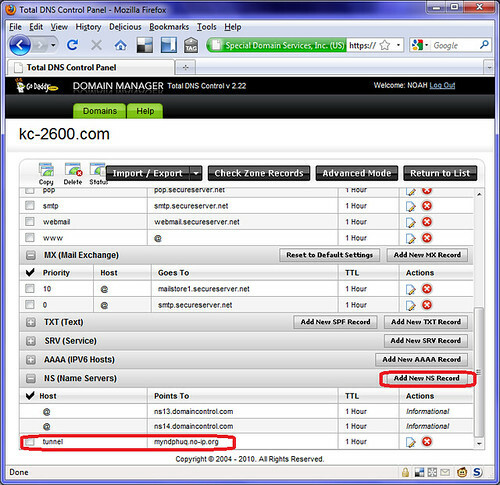 For example, Godaddy's "Total DNS control" panel allows you to easily add a sub-domain name server. In this example, I'm editing kc-2600.com and adding a subdomain of "tunnel" and pointing its name server record to my dynamic DNS. If you have a static IP, you can specify this as well. This really is the hardest part. Once you do this, you have to wait a while for the record to propagate to the root servers. But then, you're home-free. All of the tools I'm about to introduce you to will work just fine once you have your own authoritative subdomain nameserver record.